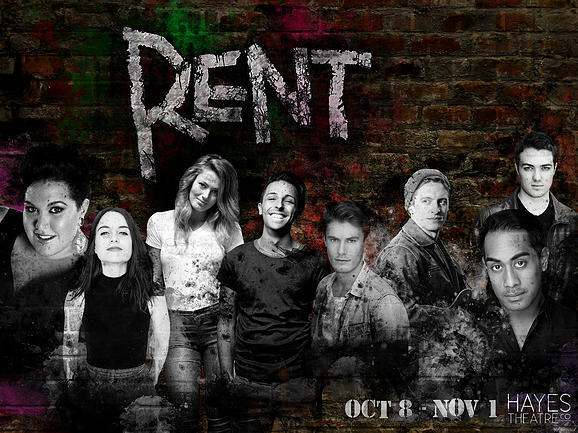 There’s no day like today for Highway Run Productions in association with Hayes Theatre Co to announce the hugely anticipated cast line up of upcoming 1990’s cult musical RENT playing from October 8 at the Hayes Theatre Co.
Director Shaun Rennie and musical director Andrew Worboys have assembled some of Australia’s finest singer/actors for this production of the award winning musical. Stephen Madsen (Heathers The Musical) plays the role of Mark, a struggling documentary filmmaker and best friend of Roger, an HIV-positive musician who is recovering from heroin addiction played by Linden Furnell, who is making his Australian musical theatre debut. Loren Hunter (Strictly Ballroom, King Kong) is Mimi, an HIV-positive stripper and dancer who is also a heroin junkie and Roger’s love interest. Laura Bunting (The Voice, Wicked) plays spunky performance artist Maureen, who is Mark’s ex-girlfriend and current girlfriend of Joanne, a tough, headstrong Harvard-educated lawyer played by one of Australia’s most celebrated female indigenous stage and screen stars, Casey Donovan (The Sapphires, Flowerchildren). Collins, the HIV-positive philosophy teacher, friend and former roommate of Roger, Mark, and Maureen is played by Nana Matapule. Chris Scalzo (Dr Zhivago, Wicked) has been cast in the role of Angel, an HIV-positive drag queen with a heart of gold and Collins’ love interest. Benjamin, played by Matthew Pearce, is the former friend and landlord of Mark, Roger and Mimi’s apartment. Completing the cast are Denise Devlin, Josh Gardiner, Jack O’Riley, Monique Sallé, Kirsty Sturgess and Chloe Wilson.